Sirius is the brightest star in the night sky – its modern name comes from the Ancient Greek Seirios (“glowing” or “scorcher”). It is actually another one of those binary stars, a white star and a white dwarf. Like Procyon, its nearness to Earth makes it much brighter in the night sky than many other stars. It is brighter than our sun, but dimmer than Rigel and Canopus. The double act of Sirius was originally two bluish stars but one burned through its resources and became a red giant before flaming out as a white dwarf. This is slowly stripping the other, larger star because white dwarfs are very dense, with much more gravity for their mass. The two also have magnetic storms when they come closest, once every 49.9 years. Alvan Graham Clark discovered Sirius B in 1862. It is appropriate that the star that began the Egyptian New Year is most visible at our New Year, when it is at the meridian of the night sky. Its flickering, changing colour often deceives new observers into thinking it’s a UFO. The helical (dawn) rising of Sirius in the summer brought hot weather to the Greeks and Romans, and was known as the Scorcher. The Romans believed that during the “dog days” of July the heat drove dogs rabid. Humans could develop a fever called seirasis, from the Greek name for Sirius, Seirios, “scorching”. According to ancient belief, the star itself gave off heat that made the 40 days following the helical rising of Sirius. The ancient Romans, who saw Sirius as red, sacrificed red dogs to it during the three agricultural festivals: the Robigalia in May to avert rust on the crops, then the Floralia and Vinalia, festivals of flowers and fruits. To the Egyptians, however, it was the sign that the fertile season was beginning. The annual flooding of the Nile, which deposited the rich black earth onto the fields surrounding the river, took place as Sirius was rising just before the sun, after having disappeared from the skies for roughly 70 days. (Before that it was too close to the sun to be seen.) This inundation took place in early July*, and was the beginning of the Egyptian year. Because of its importance, the star was made a deity – the goddess Sothis. She was usually shown as a woman wearing the crown of Upper Egypt with a star on top, and her title was the “Bringer of the New Year and the Nile Flood”. Her husband was the god Sah, or Orion, and their child was Sopdu, a falcon-headed god whose star was Venus. She achieved such importance that in the Pyramid Texts she is said to unite with the king and bring forth the morning star as their child. The king was identified with the constellation of Orion, which was setting around the same time as Sirius. It is Sothis, the daughter whom thou loves, who has made thy fresh plants in this her name of Fresh One or Year, who leads this King when this King comes to thee. This King has come to thee, O Lord of Heaven; this King has come to thee, O Osiris. One Inuit source from the Bering Straits told ethnographers that they called the star I-gha-lum-mukh-ti, “the Moon’s Dog”. When the dog is near the moon there are high winds. In the Coppermine area of the Yukon, the flickering colours of Sirius are the result of two foxes, one red and one white, trying to get through one foxhole. The ever-changing colour and brightness of Sirius also gave rise to various stories. The Iranians gave their god Tishtrya the power to change his form every tenth day of the month. He became a cow, a youth and a horse in sequence each month. The Norse called the star Loki’s Brand, appropriately enough since he was a god closely associated with fire, trickery, and shapeshifting. An Inuit myth says that when Moon and a woman were walking around, they passed a house with a lamp flickering from the breeze. The old woman in the house looked up at them and muttered “Passersby, Passersby” as she went back to her sewing. The flickering lamp was the star Sirius. 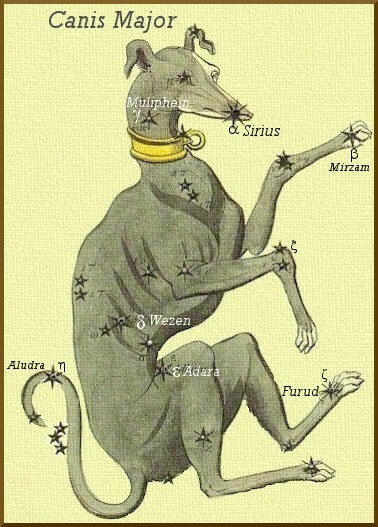 In both Indian and Celtic myth, Sirius was the main star of Canis Minor. In India, it was Svana, the faithful dog of Prince Yudhistira. The prince and his three brothers set out to find the gates of heaven, but the other three gave up. Yudhistira persevered, and he and his dog finally found themselves outside the gates, but the gatekeeper, the god Indra, said Svana could not come in. Yudhistira protested that when everyone else had abandoned him, the dog had stayed. Indra was pleased, and both dog and master could enter. In Celtic myth, the constellation Canis Major, which hosts Sirius, shares its mythology with Canis Minor and Procyon: the two being seen as the hounds of Annwn, or other mythical hunters, or indeed the Wild Hunt itself. * Note that now Sirius’s heliacal rising is in early August, in case anyone should wish to recreate the festival. This entry was posted in Astronomy, Egyptian, Mythology, Norse, Stars and tagged binary stars, dogs, Indian, Inuit on March 18, 2015 by solsdottir. A vibrant hallmark communicates confidence and also stamina.